You may remember this post I featured in the summer? 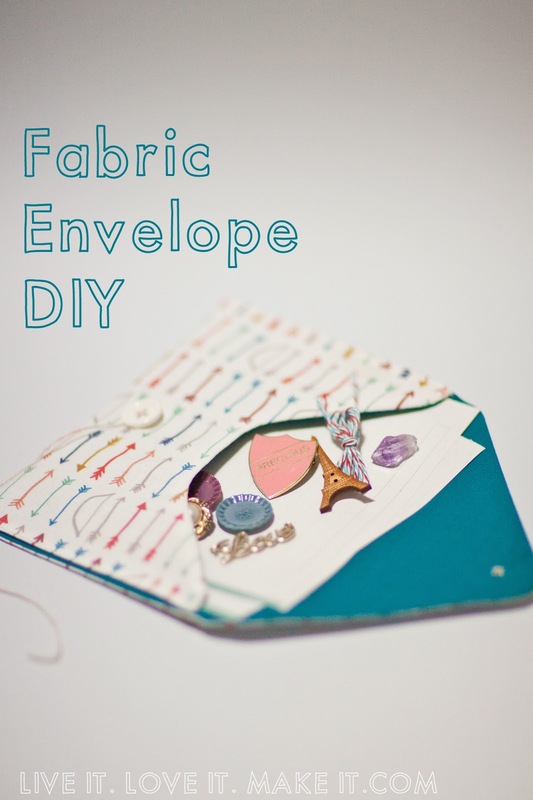 Well one of the things I want to do this year is get around to making some of these, what I call U.F.O's (Un-finished objects) So here is the first one on my DIY list, fabric envelopes. I thought these would be really cute to send to some of my friends who live a little further away, a nice change from an email or Facebook message and wouldn't they be just perfect for a special Valentine. a paper envelope, iron on interfacing (vilene), two coordinating fabrics, thread, embroidery thread, a clear cellophane bag, buttons, scissors, a vanishing pen, an iron and if you have one a sewing machine. You can of course sew these completely by hand, but I have a machine so I am going to use it. Start by cutting open the sides of your paper envelope and opening it out flat, we are going to use this as a template. Use your vanishing pen to draw around the template onto your vilene. Iron your vilene onto the fabric you have chosen for the lining of your envelope and cut it out about half a centimetre away from the line you drew to create a small seam allowance. Then you can use this to mark out what will be the outside of your envelope again using the vanishing pen, cut around the line you have drawn. Then you will have your two sides ready, you can see the vanishing pen line on the back of the lining which you can use as a sewing guide. 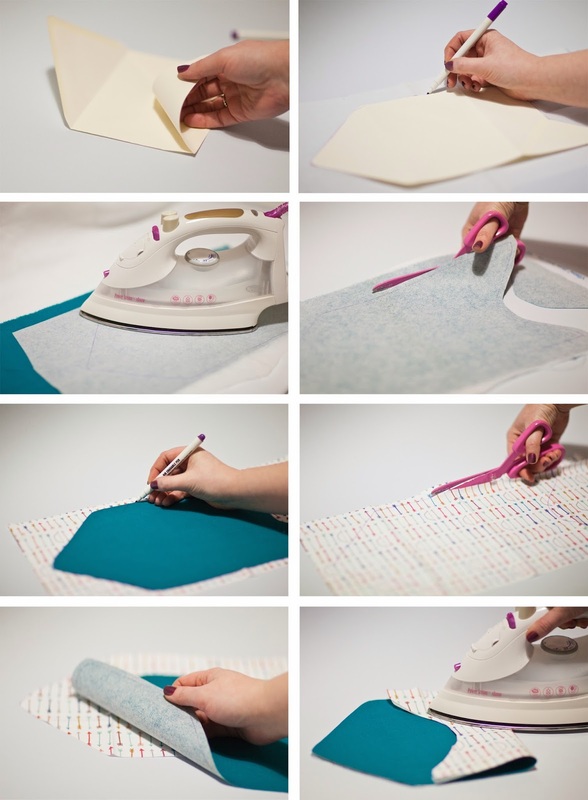 Place the two sides of your envelope together and iron the folds in place. This helps with the next stage. Place your clear plastic piece where you want your address pocket to go and cut it to size. Then with your pen mark the corners on your fabric. Put your lining to one side and stitch your address pocket in place, remember to only sew three sides so you can slide in your label. When that is on, put your fabrics right sides facing and pin them together. 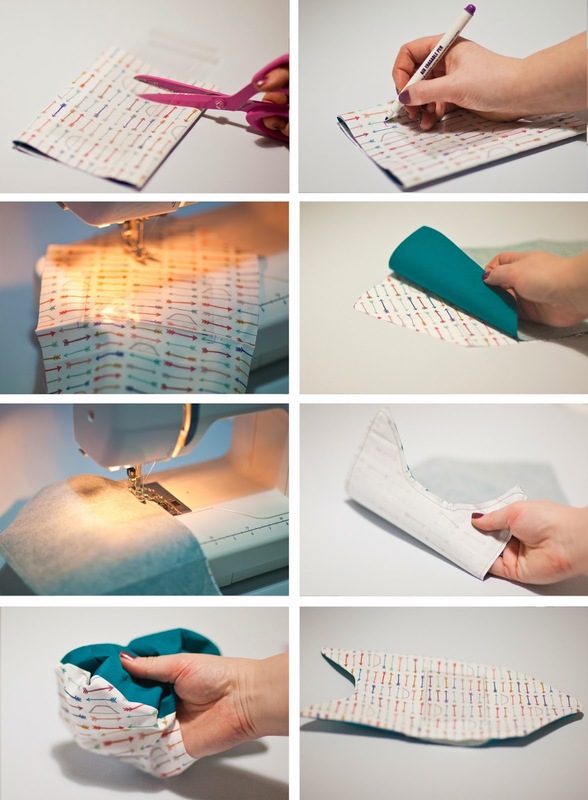 Sew around all the sides of your envelope leaving a small gap in your stitching so you can turn it through. Before you do trim your seams and cut small notches in any areas that are curved so they will look neat when it's the right side out. Find the gap you left and carefully turn it through pushing your fingers into any of the points. It should look a little like a flat fish. Take your iron and smooth it out to the edges, make sure you iron on the lining side so you don't melt your address pocket. Then fold the flaps into place and iron again. 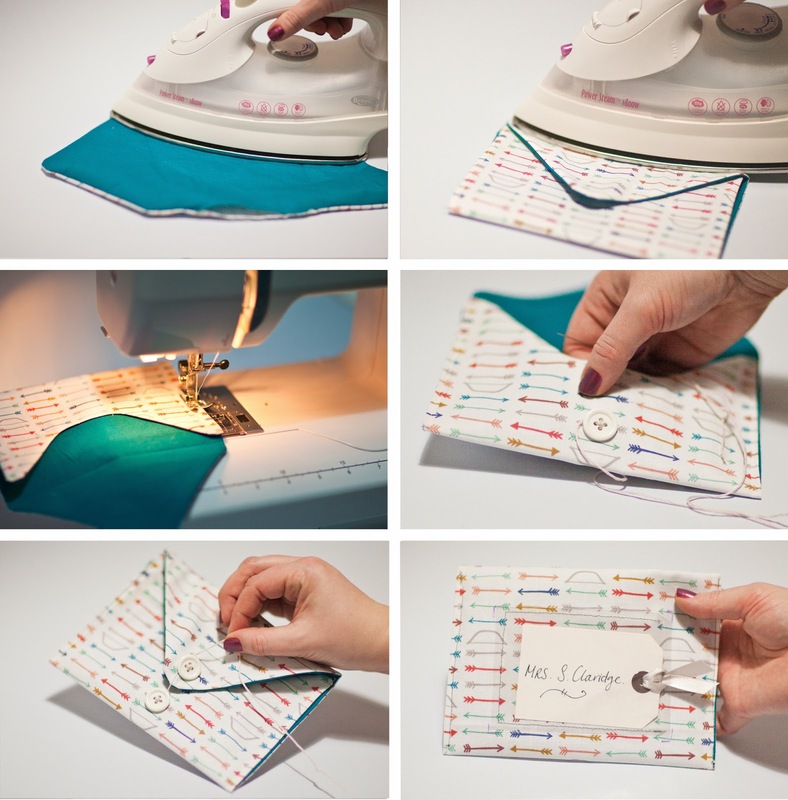 Head back to your machine and sew up both sides to create the pocket of the envelope. I chose to do a double button fastening by sewing on two buttons, one on the pocket and one on the flap with a length of thread to wrap around to fasten, but you could sew a button hole or pop some Velcro on the closure. 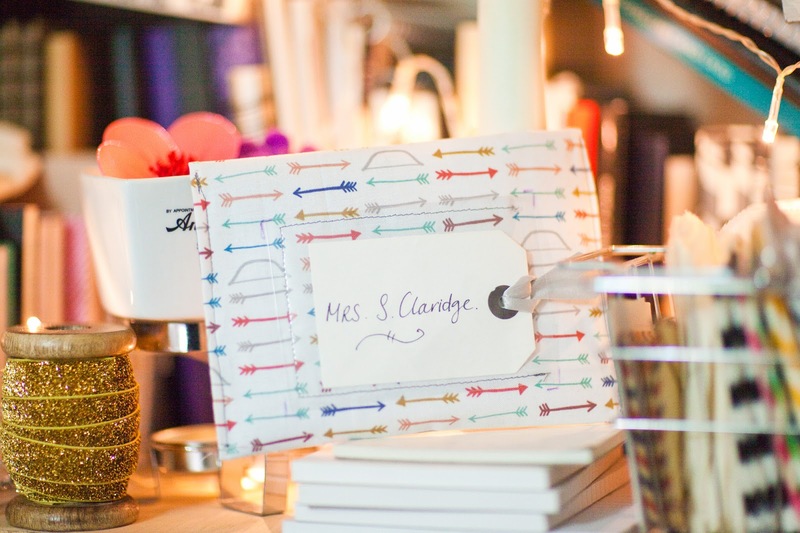 All that is left to do is to pop a label in the address pocket and you are ready to fill your envelope with a letter, card or some trinkets to gift to your friends. The fabric I used for my envelope was from Katherine Codega on Etsy.com, she has some beautiful fabrics and she designs them all herself. Isn't it pretty, I have been waiting to use this piece for ages. You could make a bunch of these for a bridal shower or as wedding favours, as well as really lovely Valentines gifts. This is so lovely, I'm actually trying to come up with excuses why I would need to make one for myself ;) Katherine really does have some beautiful fabrics, thanks for the tip there too! I'm sure you can find a good reason for making one, a mini clutch bag maybe? I Love Katherine's fabrics, her colour combinations and geometric patterns are so lovely aren't they. Hi, I love your nifty felt envelope! I have featured it at my post here, http://alittletypical.wordpress.com/2014/01/28/collage-4-i-love-envelope/. Do drop by! Thankyou your patterns are great - I have adapted slightly to make an envelope to keep wedding album in. Please see link to my blog is you get a chance. Hi Alex, Thanks so much! 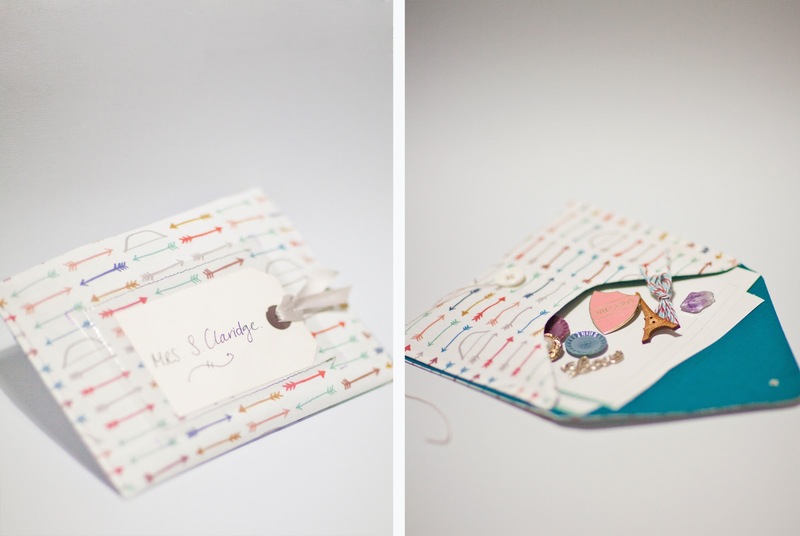 using the envelope for your wedding albums is a great idea!